Carol Peña Suárez is a 14-year-old girl who lives in the community of 9 de Octubre (Peruvian Amazon) with her parents. Carol absolutely loves school and is extremely grateful that her parents have given her the opportunity to study, but she was surprised to learn that many girls in her community leave school when they are in high school. She was concerned about this discovery so she asked her friends why girls leave high school at such a young age. She learned that it is usually because they become pregnant. The symptoms of pregnancy of the girls make it difficult to continue going to school, and even though they want to continue learning, it becomes impossible. This scared Carol because school was so important to her and she had never learned how to prevent pregnancy. She wanted to understand how to prevent this from happening to her, but she was too embarrassed to ask her parents because she thought they might be mad that she was asking about pregnancy at such a young age. One day, Carol’s mother began to listen to Minga Peru’s radio program “Bienvenida Salud”, and invited her daughter to join. The program spoke about themes that Carol had never heard before such as domestic violence, human rights, self-esteem, and sexual education. The more she listened to every episode, the more answers she found to her questions — this encouraged Carol to sit every afternoon with her mother to listen to the radio program when she got home from school. One of the most interesting themes to Carol was how to protect yourself from sexually transmitted infections and how to prevent pregnancy. Carol began recommending “Bienvenida Salud” to her peers at school so they too could learn about these important topics. By the time Carol and her peers got to high school, they understood how to prevent pregnancies and sexually transmitted infections such as HIV/AIDS. Because of this, many more females were enrolled in high school than when she was a child. Not only did Carol learn important information, but she also formed a bond with her mother because of their afternoon radio program. They were able to talk more openly and honestly and their relationship strengthened. The afternoon radio program became the part of their daily routine where they were free to share, relate, and learn. Carol is one of the 120,000 people who listens to “Bienvenida Salud” in the Peruvian Amazon. In more than 1,700 episodes of the program, themes have included democracy, human rights, domestic violence, HIV/AIDS, environmental conservation, and gender equity. These themes are so important to communities, making “Bienvenida Salud” necessary and impactful. Three days every week, the radio program is broadcast over 21 local radio stations and 17 loudspeakers in the remote communities. 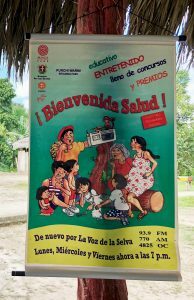 You can help Minga Peru to continue producing and broadcasting its radio program “Bienvenida Salud” and bring access to information to many communities in the Peruvian Amazon, by making a donation today!